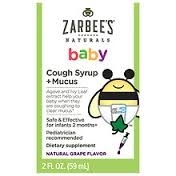 Zarbee's® Baby Cough is a safe and effective remedy that helps calm coughs and soothe irritated throats. Our baby formula does not contain any honey so it's safe for our smallest fans. This drug-free product means your family can make it through your day without the unwanted side effects and grogginess of alcohol or dyes. Consult your pediatrician before use. Under 2 months: consult your doctor. 2-5 months: 3ml. 6-11 months: 4ml. 1 year+: 5ml. Take every 4 hours or as directed by a doctor. Please consult your physician immediately for a worsening condition, high fever, rash, lethargy, persistent headaches, or symptoms lasting greater than 7 days. Store at room temperature.